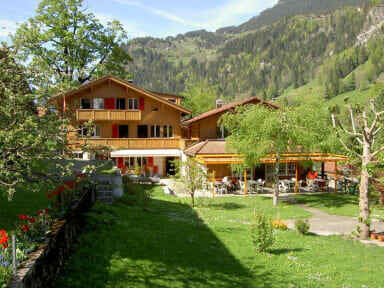 Valley Hostel i Lauterbrunnen, Schweiz: Reservér nu! There is no check in after 10PM, please not that! You can prepare your breakfast, lunch or dinner in one of our 3 kitchens in the hostel. On a nice summer day use our B.B.Q. on our large terrace. Relax while lying in one of our deck-chairs in our garden and enjoy the breathtaking view of the many waterfalls and snowcapped mountains. Want to tell your friends at home news of your travels, just say hello, or plan a trip? If you have your own notebook with you, we have free W- LAN in the house! You will also find laundry facilities on our premises. Whether it is winter, spring, summer or fall we offer a wide variety of excursions and activities which can be booked directly at our hostel. You can get all information and maps for these various excursions, hikes and activities at our reception. Take a gondola to the top of the mountains where you can explore numerous hikes and trails (from easy to difficult) and enjoy the spectacular views of the Eiger, Mnch and Jungfrau plus many other glaciers and lakes. Visit the famous Schilthorn with its revolving Piz-Gloria restaurant. Here the 007 Movie, 'On Her Majesty's Secret Service', was filmed. A train ride up to the Jungfrau might be the excursion for you. The Jungfraujoch-Top of Europe is the highest-altitude railway station in Europe. See the amazing views from its observation terrace the Sphinx (A winter wonderland all year round). In winter, spend the day on skis or a snowboard exploring the 120 km of slopes in our area. On the Mannlichen-Kleine Scheidegg you can ski the whole day at the bottom of the Eiger, Mnch and Jungfrau. From the Schilthorn, you can ski all the way down to Lauterbrunnen (it is a ski run of 16 Km in length). The ski rental is just next door from our hostel! If you are not a skier, you can still enjoy the outdoors in winter with the many hiking/walking paths at First or sledding on the Eiger Run. Our Motto: Check in as a guest, leave as a friend!